It is so pretty and well made. 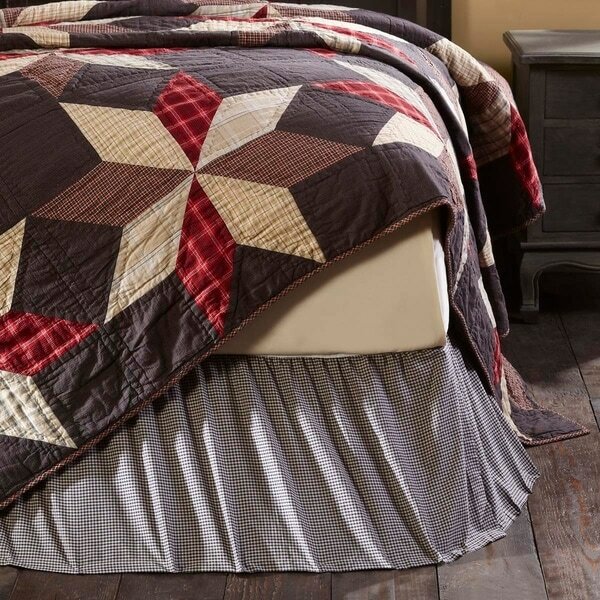 Complete the look of your bed with the Liberty Stars Bed Skirt. Featuring navy and white check cotton with a beautiful gathered ruffle with a 16" drop. The skirt is finished with split corners. This navy gingham bedskirt looks great with this quilt and ties it all together well. Very rustic, country and welcoming feel. I like that the bedskirt matches one of the patchwork throw pillows that I ordered. Beautiful accent to a gorgeous collection. Well made and fits perfectly! Nice...just wish they made it to be a little less "flowing"...more fitted..other than that, like it as I have both brown and black in the room so this helps bring out the black in the matching quilt set (no the set shown...but the similar set advertised with it).